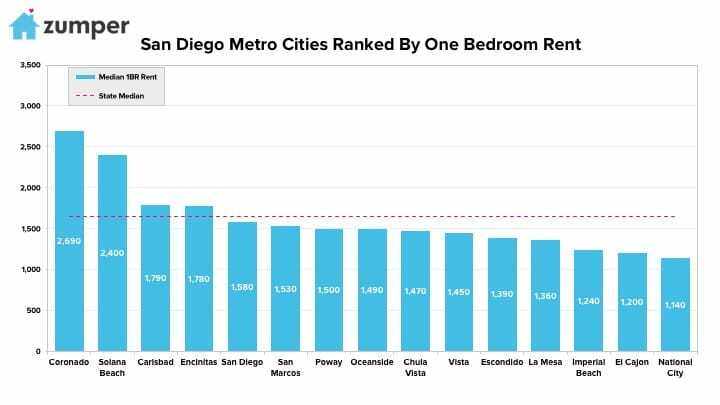 The Zumper San Diego Metro Report analyzed active listings in June across 15 metro cities to show the most and least expensive cities and cities with the fastest growing rents. –Coronado, CA rent fell $140 since last month to $2,690 but held onto its position as the most expensive in the metro. –Solana Beach, CA was the second most expensive city to rent with one bedroom units priced at $2,400. –Carlsbad, CA ranked as third with rent at $1,790. 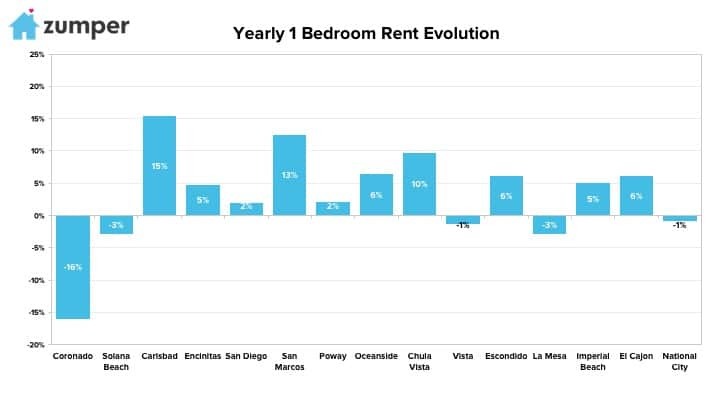 –National City, CA rent fell $60 since last month but continued to be the most affordable in the metro. –El Cajon, CA was second with rent at $1,200. –Imperial Beach, CA ranked as third at $1,240. –Carlsbad, CA had the fastest growing rent, up a whopping 15.5% since this time last year. –San Marcos, CA saw a 12.5% increase in rent, making it second. –Chula Vista, CA had the third largest yearly growth rate, climbing 9.7%. –Chula Vista, CA also had a huge monthly growth rate, up 5%. –Carlsbad & Encinitas, CA tied for second with rents jumping 4.7%. –Solana Beach, CA was third with rent growing 4.3%. The Zumper San Diego Metro Report analyzed active listings that hit the market in June 2017. Listings are aggregated by city to calculate median asking rents. In the market for a new place? Search all San Diego apartments for rent on Zumper now.